THERE COMES A TIME IN ALMOST EVERY MAN’S LIFE WHEN HE CHOOSES TO SETTLE DOWN WITH THE ONE WOMAN HE REALLY CARES ABOUT, LEAVING EVERYTHING ELSE IN THE PAST. When Joel Buchanan of Jacksonville, Illinois, hit this point in life, it was game over. Yet, when something ends, something else always begins, and that’s where Joel’s F-150 comes into play. Just a few weeks before getting married, he purchased the truck from a local Ford dealer, 1 of only 4,726 Ford produced that year. 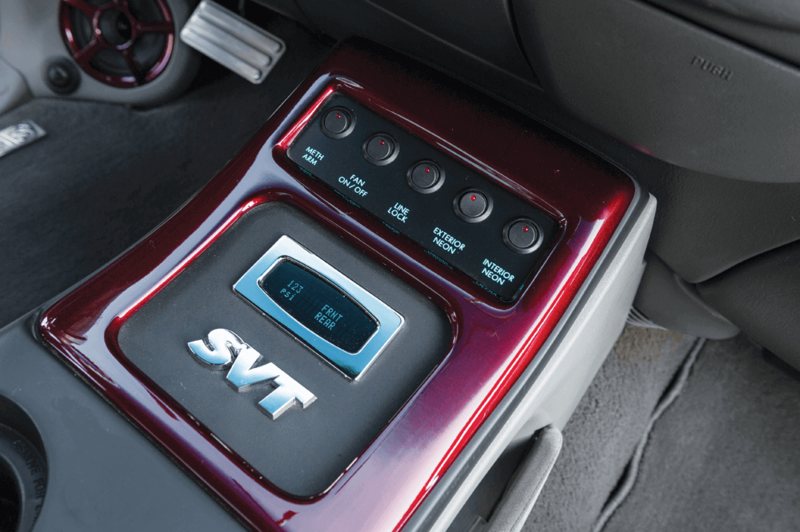 The truck, an ’02 F-150 SVT Lightning, was nicely optioned from the get-go, but Joel could not leave the SVT alone. What started as small mods began to snowball into larger scale changes, which led to where the truck, appropriately named Game Over, sits today. 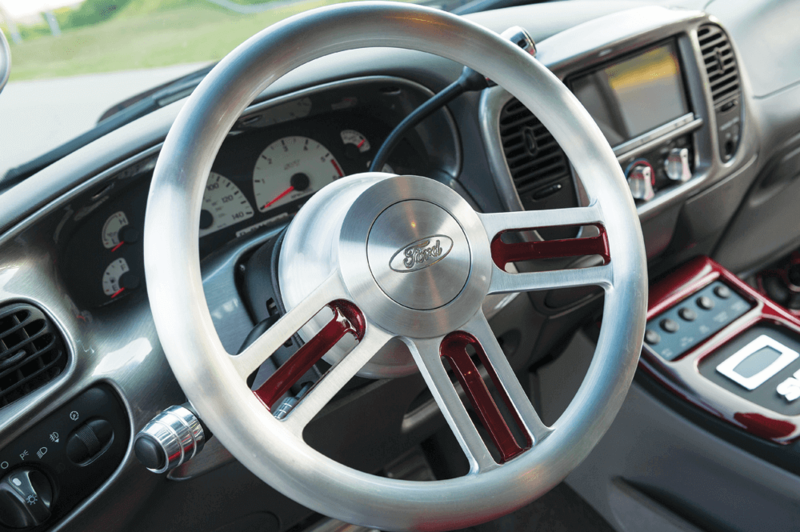 From stereo upgrades to static drops and wheel changes, the Ford went through many iterations during the ensuing years. Once Joel realized that he needed to give in to the mod bug completely, he didn’t hesitate. Starting with the suspension, he and the FH Customs crew began putting together his ideal kits. Using a cantilever system combined with a parallel 4-link setup, the team assembled the rear of the F-150 to function well with the Belltech drop spindles and Airlift setup they’d mounted up front. They also narrowed the rearend 2 inches to allow perfect fitment of the aggressive wheels that would soon call this truck home. 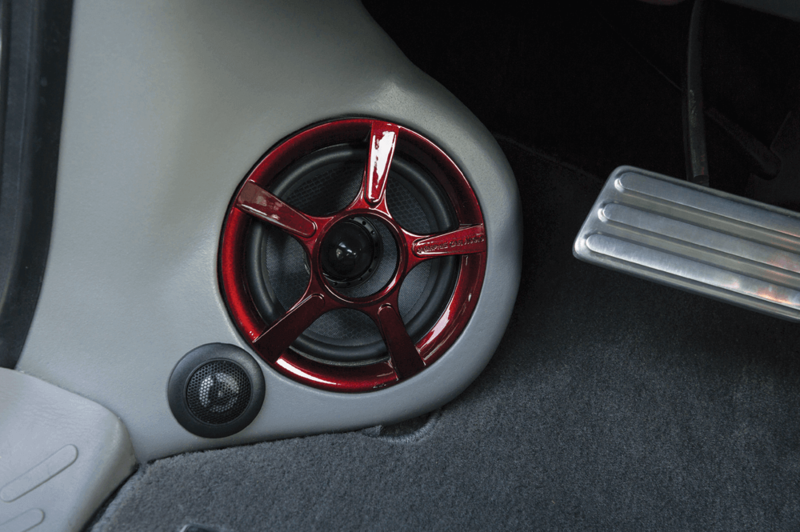 Powered by a 500-hp Whipple-supercharged V-8, no thin, weak wheels could be considered. After much debate, Joel chose a set of staggered Raceline Majestic wheels, custom brushed with red accents. With the suspension wrapped up, the rest of the modifications began. Starting with a 2.5-inch steel cowl hood, billet grille and custom lights all around, the Lightning was starting to really take shape. Paint was one of the two things Joel let someone else do for him. Being very particular about who was cut out for the job, Joel chose Jeff Schroeder of Attitude Custom Airbrushing and Paint. Laying out the Galaxy Gray and Brandywine Kandy from House of Kolor, Jeff tied in the red accents on the wheels, adding skulls to the graphics by hand. Those same colors were draped over the guts of the truck’s micro-suede interior too. 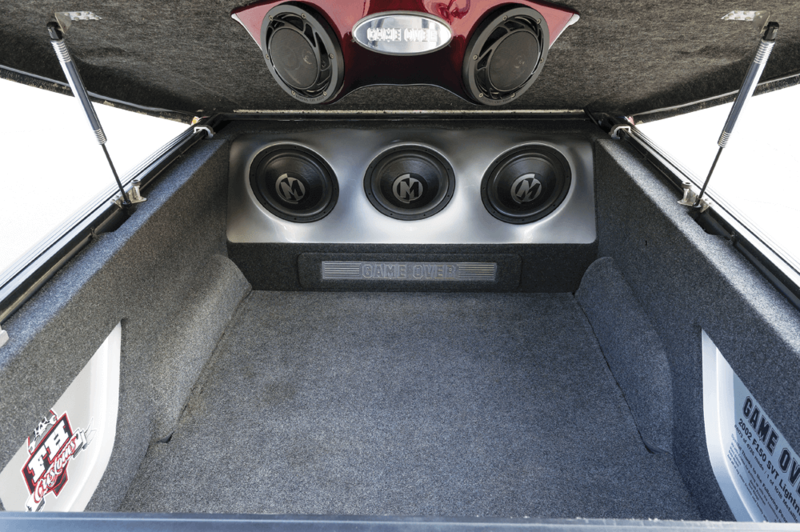 A large Memphis stereo setup was organized to make sure the Bassani exhaust wasn’t the only thing Joel heard when cruising. 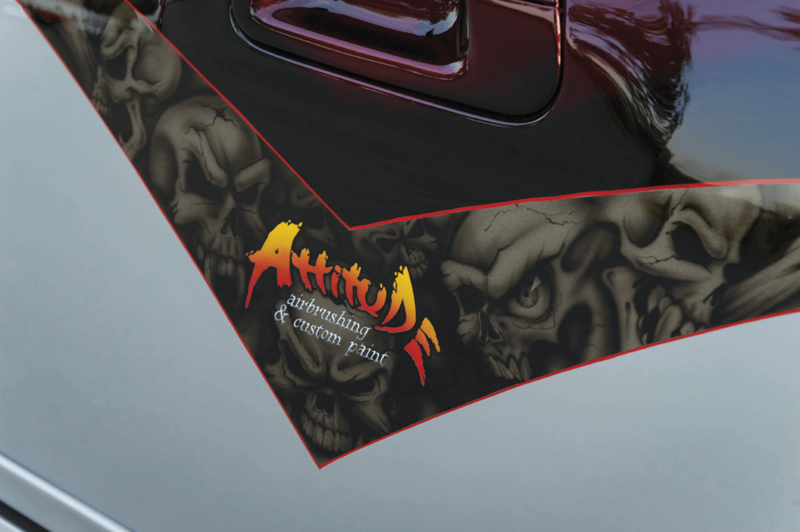 With endless hours of custom fiberglass work, along with an amp rack and a unique pod setup under the tonneau cover, Game Over is a force to be reckoned with whether parked or on the move. THE HAND-LAID GRAPHICS AND STRIPING PERFECTLY ACCENT THE PAINT. THIS CUSTOM SWITCH SETUP IS SO CLEAN IT LOOKS LIKE A FACTORY OPTION. THERE’S NOTHING SUBTLE ABOUT THE POWER THIS TRUCK PACKS UNDER ITS HOOD. 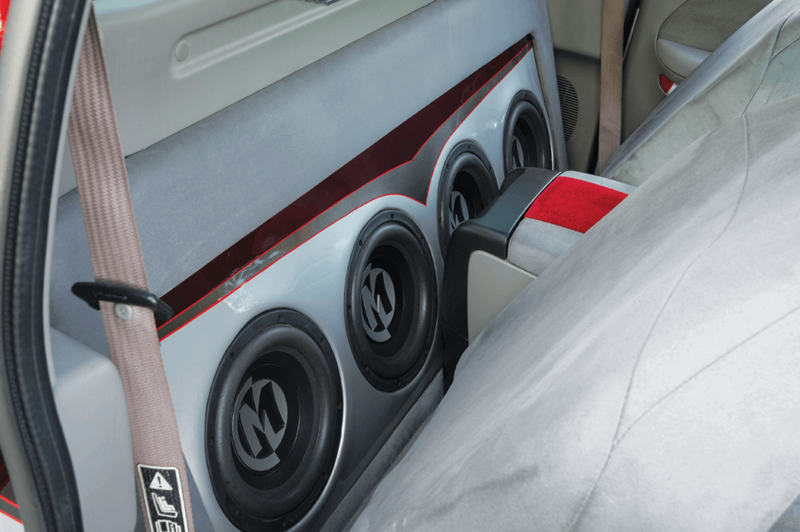 IN CASE THE CAB DIDN’T HAVE ENOUGH SOUND, THERE ARE MORE CUSTOM ENCLOSURES IN THE BED.